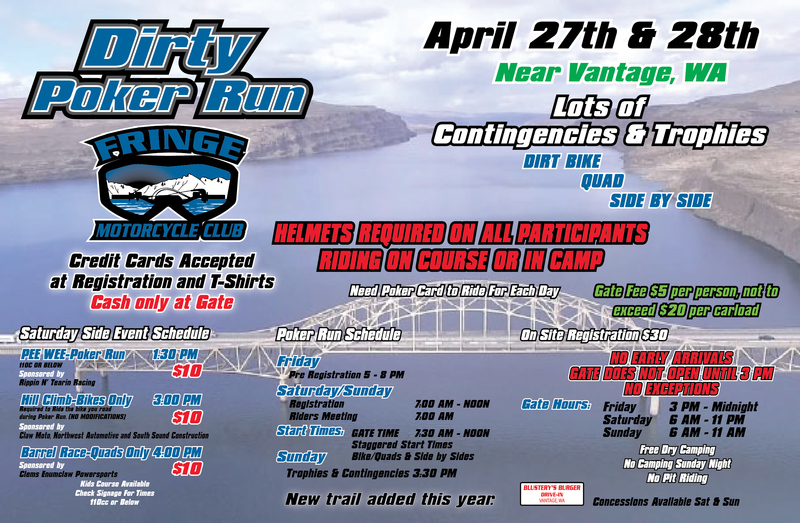 Due to your growing concerns regarding adverse weather and course conditions, FringeMC has decided to reschedule the Dirty Poker Run to the weekend of April 27-28, 2019. Only the date for this event is changing. All other information and event details will remain unchanged. We apologize for mother nature’s aggressive mood swing this year. She may not have had your safety in mind, but we do! We hope to see you in April at the Dirty Poker Run. Please spread the word! Also for Bike rider sign up for the Hill Climb at 3pm on Saturday in the dust bowl. This is a fun event to show your skills to get up Fringe Hill. MUST Ride the bike you road for the poker run. No Mods. Quads we have Barrel races. Try your skills on your Quad getting thru are barrel course. Sign up for the Barrel race at 4pm on Saturday in the dust bowl. 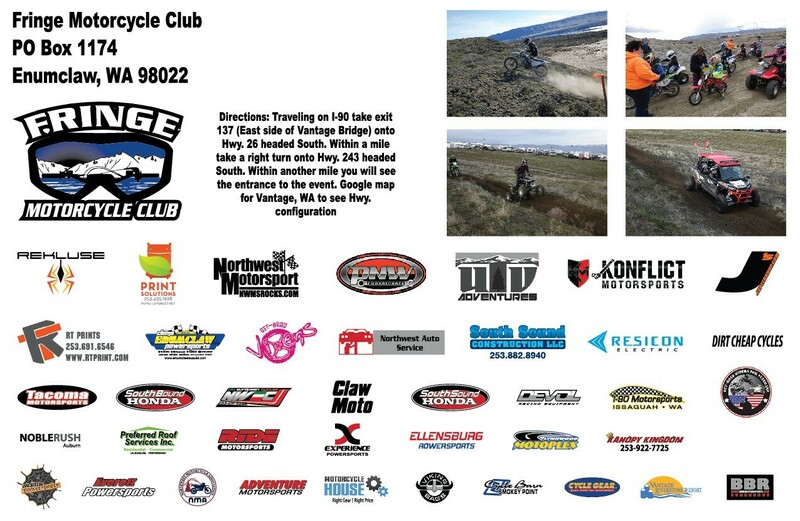 This is a fun event to show your skills on your Quad. For Side by sides we would recommend you have a flag on your side by side. Next year it will be required for safety. With there being two different courses it will be a staggered start from 7:30 am to noon. The Poker Run courses closes at Noon each day. Gate opens at 3pm on Friday. NO Pit Riding by adults or children on property other than to and from scheduled rides. Be Present to Win for the Prizes on Sunday at 3:30PM. DOGS must be leashed and SCOOP YOUR POOP! Have question about the event? Where is the Poker held? Click on the picture to be taken to Google maps. How long is the course? The course is about 30 miles. How difficult is the ride? it is not a hard ride. There are lots of whoops out there but it is a easy ride for the family. How many riders do you expect? The Fringe poker runs are becoming very well known. We have had 2000 riders on a Saturday event. Sundays there are fewer riders, as some riders come out just for the day. What check point is the best one? What type of question is this? They are all great. The Fringe staff are always looking for ways to set up fun check points. Each one will be a little different but in the end you will meet some of the friendliest members greeting you as you ride up. It's you, the rider, that makes their day a blast! They love to hear about your ride. Can the whole family ride the poker run? YES, YES and YES! Fringe has a strong commitment towards family riding and family time. Check out the "About" page on the site to learn how it all started. Do I have to wear a helmet at all times? YES!!! Duh, we want everyone to be safe and have a good time at our events. How do I know if I'm on the right trail? The Trail for Bikes and quads will have Orange ribbon, The sxs trail will be marked with blue ribbon. What should I have on the trail to make it a great ride? Snacks, in case you get a little hungry before you get to check point Chilly. While the chilly last!!! When can I show up to camp and when do I have to leave? From Friday 3pm gate opens to Sunday after the awards cermony. The staff need time to clean up the campsite and get it looking better than we found it. We like to leave no trace of the event on the land - only in photos and great memories of the ride. How much is the gate fee? It’s $5 for each person up to 4 people in the truck for a max of $20 dollars. So if you bring your clown car with 20 of your clown friends in the car you only have to pay for 4 of them. What is dry camping? Dry camping means you have no water, showers, like you would find a nice state park. Do you have bathrooms at camp? Yes, we have we have Honey Bucket at camp and at the check points. What is the cost to camp? Zero, nothing, nada. You ask yourself, how can they do that? Because we have great land owners who are supportive of the sport and try to help us keep the cost down then we pass that along to you. You do not have to thank us now. Do we have water available in camp? Nope! Sorry there is no water at the camp site. Are there places to eat around camp? Over in Vantage you can eat at “Blustery's Burgers Drive In". Blustery's, in the past, has parked their mobile truck up by registration. So, next time stop by and pick up great food from them. Also, in Vantage there is "The Golden Harvest Restaurant". What type of cell coverage do we get at camp? We do have cell service! How would we survive without it? Another great reason to come do some great riding during the day and then post all your great pics to the Fringe Facebook page to show all your friends what they are missing out on. What do I do with my trash? We bring in large 40 yard trash bins to place all that trash in.